I used to think about how my home would sound with children rattling around in it. At night, the sound of soft sighs and silly sleep talk, during the day, the pitter-pattering of feet, the “mooOOOOmmm!” call, the giggles, the ALL of it. I wanted it so much. And yes. Of course the reality of the sound is not as sparkly as the dream of it. It is so much more, oh that’s what my mom was talking about when she said, “I can’t hear myself think!” But it still sparkles a bit and I do love the sound of it. 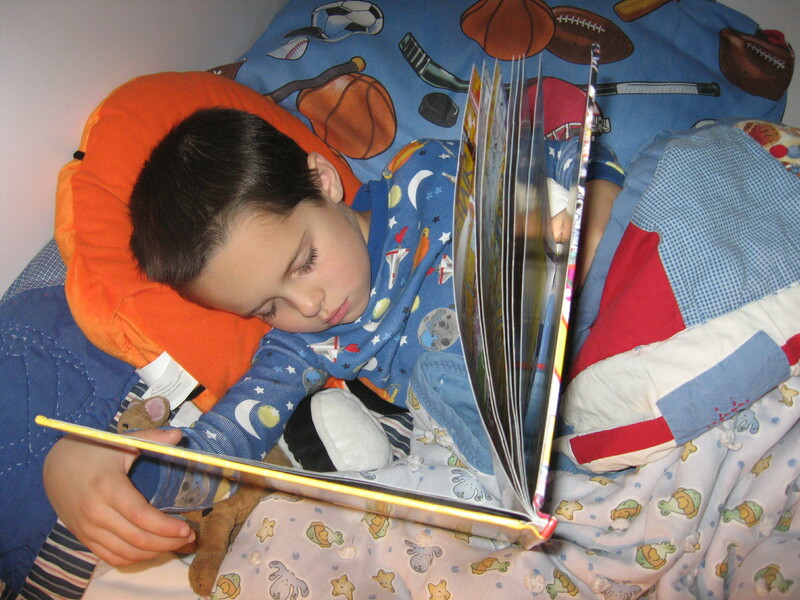 Him – age 5, sleep reading. When he plops himself on the couch, in a corner, or on his bed with a book, the noise of the world floats away, the noise of a new world floats in instead. The magical words jump off a page, through his eyes, and into his imagination. And the sound from where I sit? The sound of his brain growing, the whisper and promise of a page turning, or even, later, the conversations about books with his dad, with his brainiac cousins? Oh, how I love it. It is all the sparkle of that first dream but even better. I’m painting idyllic, because it is. My boy is equal parts tornado, Mario wii, and “Mom, I’m glad I didn’t tell you about this stunt I pulled earlier because you would probably think I’d get hurt, but I’m not.” So it makes the sound of reading even better. Besides, in this world where I have kiddos who have someone else’s genes, it’s good to know I’m giving them something. The reading? The sound of reading? That’s on me. I gave them that. On top of my squishy adoration and solid belief that they are amazing, it is everything they need. Isn’t it?